Comments: John Lee Pitts, Sr., was born on April 18, 1863, in Scottsville, Virginia, and was the son of Jonathan and Mary Agnes (Snead) Pitts. At the age of fourteen, John was Captain of a James River and Kanawha Canal boat, one of three boats owned by his father. John's boat hauled hogsheads of tobacco on the two-day boat trip between Warren and Richmond, Virginia. Laden with commissary goods, hardware, and other manufactured products, the return trip to Warren on John's boat took three days. By 1878, the Canal was struggling financially and could not compete with the railroad, which stole away its freight and passenger business. In 1880, the Richmond and Allegheny Railroad purchased the Canal and began laying ties on the Canal's old towpaths. 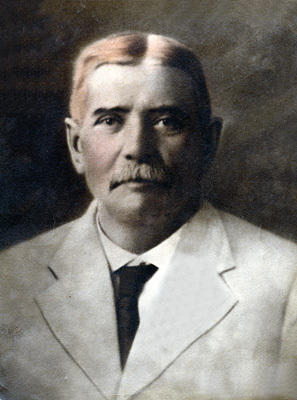 A smart businessman, John Pitts went into the railroad construction business and prospered. By the 1920's, he was a senior member of Pitts and Morris, a railroad-contracting firm with extensive operations in Virginia. (1) David Gordon Pitts (1885 - 1901) was born on August 19, 1885, in Scottsville, Virginia. He was stricken with typhoid fever at the Pitts' Belle Haven home and died tragically on July 13, 1901, in Scottsville. David was buried near his grandfather, Pleasant Burgess, at the Burgess family cemetery in Locust Grove. (2) Arthur Marion Pitts (1887 - 1932) was born on October 26, 1887, in Scottsville. He attended a Boy's Academy in Bedford, Virginia, and Randolph Macon Academy. Marion attended Virginia Military Institute in Lexington, Virginia for three years. He worked for his father's railroad construction business and married Julia Elizabeth Holladay on October 12, 1910, in Albemarle County, Virginia. 'Bess' Holladay was born on August 29, 1886, in Spotsylvania County, Virginia, and was the daughter of James P. and Mary F. (Dillard) Holladay. Marion and Bess Pitts were the parents of four children: Florence Barclay, Margaret Mason, James Gordon, and Marion Arthur Pitts, Jr. Marion Pitts died on July 19, 1932, in Scottsville and is buried in the Pitts family section of the Scottsville Baptist Church cemetery. His widow, Bess, remarried in 1962 to Bickerton L. Phillips in Richmond, Virginia; she died on September 6, 1975, in Petersburg, Virginia. (3) Clara Lee Pitts (1889 - 1951) was born on June 21, 1889, in Scottsville and was the daughter of Captain John Lee Pitts and Florence Lindsay (Burgess) Pitts. She attended Scottsville Schools and was active in the Scottsville Methodist Church. Clara married Charles Richard Dorrier on October 25, 1911, in Scottsville, and they lived at The Cottage on Belle Haven farm until their Hill Top home was built on James River Road in Scottsville. 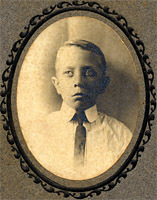 Charles Dorrier was born on May 15, 1885, in Scottsville, and was the son of William and Catherine Ann (Ritchey) Dorrier. Charles and Clara owned and operated C.R. Dorrier and Company, a general store at the southwest corner of West Main and Valley Street in Scottsville. The Dorriers were the parents of five children: Charles Richard, Jr.; Sara Elizabeth; John Lee; Lindsay Gordon; and James Lee Dorrier. Clara died on June 10, 1951, in Scottsville; she is buried in the Scottsville Cemetery. Her husband, Charles, died on May 30, 1966, in Charlottesville, Virginia, and is buried at Scottsville Cemetery. (4) John Lee Pitts, Jr. (1894 - 1984) was born on September 16, 1894, in Scottsville, and was the twin brother of Floyd Lindsay Pitts. 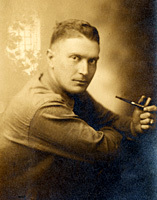 He attended Scottsville schools and graduated in 1916 from Virginia Military Institute in Lexington, Virginia. John excelled in athletics and was inducted into the VMI Sports Hall of fame in November 1975 for excellence in their basketball, football, and baseball programs. He served in World War I and achieved the rank of Major. After the war, John worked for General Motors Corporation in New Jersey. He married Laura Margaret Connellee in the winter of 1917-1918 in Middletown, Delaware, and they became the parents of two children: John Lee Pitts, III, and Alice Cochran Pitts. John Lee Pitts, Jr., died on March 4, 1984, in Bloomfield, New Jersey; he is buried in the Scottsville Baptist Church Cemetery. Laura Pitts died on May 13, 1971, in Middletown, Delaware, and is buried in the Scottsville Baptist Church Cemetery. (5) Floyd Lindsay Pitts (1894 - 1962) was born September 16, 1894, in Scottsville; he was the twin brother of John Lee Pitts, Jr. Like his twin, Lindsay attended Scottsville schools and the Virginia Military Institute. Lindsay became a Major in World War I and married Martha G. Dillard on February 20, 1918, in Richmond, Virginia. Martha was born on August 10, 1894, and was the daughter of Dr. Benjamin Lewis and Maude G. (Baptist) Dillard of Scottsville. She was serving as an Army nurse at Camp Lee, Virginia when stricken with typhoid and died on October 25, 1918. After the war, Lindsay returned to Scottsville to join his father in railroad construction and later became a farmer and businessman. His second marriage on June 2, 1921, was to Hester McFarlane in Albemarle County, Virginia. 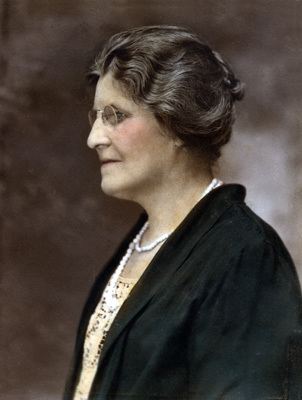 Hester was born on March 8, 1897, in Chicago, Illinois, and was the daughter of Hugh F. and Norah (Bergen) McFarlane. Lindsay and Hester were the parents of four children: June, Nancy, Lindsay, and Nora Pitts. Lindsay died on April 26, 1962, in Charlottesville, Virginia, and is buried in the churchyard of Christ Church at Glendower, Virginia. Hester died on July 26, 1968, in Reston, Virginia, and is buried at Christ Church in Glendower, Virginia. (1) Helen Virginia Pitts (1898 - 1959) was born on September 14, 1898, in Scottsville, Virginia. She attended Scottsville schools and graduated from Randolph Macon Women's College in Lynchburg, Virginia. After graduation, Virginia worked as a social worker in Richmond, Virginia, and Chester, South Carolina. Virginia married Shirley Brooks Parler in Scottsville on October 3, 1923, in Scottsville. Shirley was born on February 25, 1898, in Orangeburg, South Carolina, and was the son of Brooks A. and Susan (Parniece) Cuttino. After graduation from Clemson University, Shirley owned and operated a florist shop and greenhouse in Columbia, South Carolina. Virginia and Shirley Parler were the parents of three children: Helen Virginia, Claire Parniece, and Shirley Brooks Parler. Virginia (Pitts) Parler died on December 1, 1959, in Columbia, South Carolina, and is buried there in Elmwood Cemetery. Shirley Parler died on February 25, 1965, in Columbia and is also buried in Elmwood Cemetery. (2) Katherine Elizabeth Pitts (1907 - 1992) was born on January 19, 1907, at Belle Haven, her family's Scottsville home. She attended Scottsville public schools and completed her undergraduate degree at Randolph Macon College in Lynchburg, Virginia. Katherine also completed one year of graduate work in Berkeley, California, and taught school for many years in Scottsville. On April 6, 1929, Katherine married John Randolph Phillips, who was a fellow Scottsville High School graduate and a free-lance writer. Randolph Phillips was born on October 6, 1904, in Lynchburg, Virginia, and was the son of Charles R. and Mary Ella (Nichols) Phillips. Katherine and Randolph became the parents of a daughter, Kathleen Elizabeth Phillips, who was born at Belle Haven in Scottsville on June 2, 1931. Katherine (Pitts) Phillips died on January 5, 1992, in Charlottesville, Virginia, and is buried in the Pitts family section of the Baptist Church cemetery in Scottsville. (3) Dorothy May Pitts (1909 - 1993) was born on January 30, 1909, at Belle Haven in Scottsville. She also attended public schools in Scottsville and Fassifern School in Hendersonville, North Carolina. Dorothy graduated from Virginia Intermont College in Bristol, Virginia. On October 17, 1934, Dorothy married Russell Wood Jordan, Jr., in Scottsville. Russell was born on August 26, 1905, in Emporia, Virginia, and was the son of Russell Wood and Jennie Elizabeth (Tillar) Jordan. Dorothy and Russell lived in Richmond, Virginia, where he was a lawyer and a professor of law at the University of Richmond. They became parents of four children: Barbara Lee; Russell Wood, III; Sally Lee; and Judy Clark Jordan. Russell Wood Jordan, Jr., died on February 12, 1959, in Richmond and is buried in the Pitts family section of the Baptist Church cemetery in Scottsville. Dorothy (Pitts) Jordan died in 1993. In 1901, John and Helen Pitts purchased a large Victorian home, called Belle Haven, which sits on a hill overlooking the James River at Scottsville. Built in the 1880's by an English family named Clark, Belle Haven was equipped with modern amenities including electric lights, steam heat, and hot and cold running water. Helen landscaped the spacious grounds around their new home and raised lovely roses there. John continued to prosper and be an influential Scottsville citizen, serving as a member of the Board of Supervisors for the Scottsville District of Albemarle County for many years. John became very ill at Belle Haven and was transferred to Richmond for treatment; he died a few days later on May 15, 1924, and is buried in the Pitts family section of Scottsville's Baptist Church cemetery. His widow, Helen, lived for many years at Belle Haven with her daughter and son-in-law, Katherine and Randolph Phillips. Helen died on March 30, 1962, at Belle Haven and is buried in the Pitts family section of Scottsville's Baptist Church cemetery. These Pitts family photographs are part of the Kathleen (Phillips) McNamara collection. Kathleen resides in Scottsville and is the granddaughter of Captain John Lee Pitts and Helen Amanda (Burgess) Pitts. She is the daughter of Katherine Elizabeth Pitts.